Please note that our Jackpot now stands at a Whopping €10,300. Now is the time if you are not already signed up to register. Not only are you helping your club but you are in with the chance of a great win. There was no Match 4 winner of the Club Lotto on Friday, 31st October when the numbers drawn were 9, 14, 15 and 22. It is €2 per week but goes a long way towards running all the facilities that we have. Ann Carroll gets the lucky dip. Further details are available at www.brayemmets.com. Junior B Championship Final Replay 2014. Our men’s junior football team travelled to Arklow last Saturday to take on Rathnew in a replay of the Wicklow Men’s Junior B football final. The weather conditions were very poor for the game, but this did not dampen the spirit or resolve of the Bray lads. Bray lead at half time on a score line of 1-2 to 0-1, with a fine point by one of Brays veterans Raymond Lambe, and a well-executed goal by Garret Crowley. The weather condition did not improve for the second half, but Bray continued to battle well against Rathnew, with some good tackling, and well executed scores from Ben McCormack, Cathal McGee, Matt Thompson and Dylan Terry, Bray ran our victors on a score line of 1-9 to 0-3. The man of the match was Peter Walsh, who had a very strong game for the victors. Other notable performances were from Brian O’Keeffe, who ended his playing days with Bray on a high. The Bray captain Mark Mulvaney accepted the cup on behalf of the team, with a lengthily acceptance speech as Gaeilge, and the celebrations continued in the Ardmore in Bray. This was a good team performance on the day. The team is a mixture of youth and age, with the vastly experienced Brian, Ray, Oisin and Geoff, along with the introduction of seven minors from this year’s minor football panel in to Adult football. The team on the day lined our as follows: Lee Brandon, James ‘Taz’ Duggan, Geoff Morrissey, Mark Mulvaney (Captain) Mark Mulvaney, and Oisin O’Hannaigh. Shane Lohan, Ray Lambe, Brian O’Keeffe, Eoin McCormack, Peter Walsh, Donnie O’Midheach, Ben McCormack , Cathal McGee, Garret Crowley, Matt Thompson for (G. Crowley) Dylan Terry (D O’Midheach) Ross Masterson (E McCormack) Fin Greene (Taz Duggan) Shane O’Sullivan (C McGee). On foot of this Championship win we now play Blessington in the Swan Cup next Friday night (7th November) in Eire Og, Greystones, and throw in is at 7.45pm. This competition is the Junior A Champions playing the Junior B Champions. We would encourage you all to come along and support the Bray lads on Friday night in this unique competition. The Junior team also have a league game against Ashford on Sunday 9th, in Old Conna at 11.00am. Bray Under 12 Hurlers finished the league campaign with a well-deserved win against St Maurs to finish top of their group and remain unbeaten in Dublin this year. The lads played St Maurs in their home pitch in Rush, a long journey but for once no-one got lost. Missing a number of players through injury and holidays Bray were fortunate to be able to call on two under 11s to make up the squad. Playing into a strong breeze Bray settled very quickly and had St Maurs under pressure from the off, Sam and Philip bossed the midfield area and played good quick low ball in the dangerous forward line of Zack, Brian, Cathal and Daniel F and were soon ahead. It must be said that St Maurs keeper made some exceptional saves in the first half to keep St Maurs in the game. As the half wore on St Maurs came more into the game but the very tall and fit half back line of Tadhg and Eoin repelled a lot of the Maurs attacks. Anything that got past them was dealt with very efficiently by Aaron and Peter and Gavin in goal had a quiet game such was the protection he had in front of him. St Maurs did not give up however scoring a goal and two excellent points. The introduction of Michael, Daniel M and Riain who scored a great goal ensured Bray finished the half well and were well ahead at half time. In the second half the wind was at Bray‘s backs and if anything got stronger with Bray continuing on where they left off in the first half to run out comfortable winners. This was a great performance with everyone contributing to the win. Special thanks to St Maurs for hosting us and to the referee who came in at the last minute to ensure the match went ahead. This team have been excellent throughout the season, starting back at training in January and working hard and contributing positively in training and games throughout the season. The team have improved out of all recognition from last year and special credit must go to Terry, Brendan, John, Michael, Peter and Niall for all the work that they put into the team through the year. The team bought into what the coaches were trying to do and the coaches were very lucky to have such a hardworking group of players to work with. They have been a credit to their parents, their coaches and to the club. Training for this group will continue until the end of November in both hurling and football. Finally hurling by its nature is a skill based game and the coaches are asking that every member of the group continue to hurl throughout the winter to keep their skill levels up so that they are ready for the under 13 Hurling league in Dublin next year. The Wicklow Under 14 hurling final will take place in Arklow at 12.30 this Saturday afternoon when we take on Carnew. This is the team that won the Feile and all support will be welcome. On Wed 15th, we played Donard in the Wicklow Camogie Minor Final. Having won the toss for the venue the game was played in Bray. The first half was a tight affair with Donard taking the lead by 3pts within the first ten minutes. The girls started to claw their way back and soon it was level at 3pts each before Coaimhe struck for a great goal. Donard went down field and were awarded a penalty. The penalty was struck well but Sophie in goals got her hurl to it to deflect it out and we cleared our lines. We went on the attack again and were awarded a penalty with Niamh scoring a point. Donard scored again to leave the half time score at 1.4 to .04 in Bray‘s favour. The second half was a great display by the Bray girls. Their passings, scoring, defensive play and work rate was outstanding. It was a great team effort.We scored 5 goals and 5 points in the second half Donard battled hard and got their reward at the end of the half by scoring a goal and two points to leave the final score 6.9 to 1.6 with Bray claiming the Minor title for 2014.Our scorers on the night were Coaimhe Lohan 4goals 2pts ,Kelly Gilbert 2g2pts ,Niamh McCormack 3pts ,Anna Molloy 1pt ,Rachel Hand 1pt .Well done to all the girls- a great performance!! Bray Emmets were crowned U14 County Champions in Arklow last Saturday after a brilliant display of football. They recovered from conceding a goal in the first minute of the match to lead at half time against the wind and then dominated large periods of the second half. 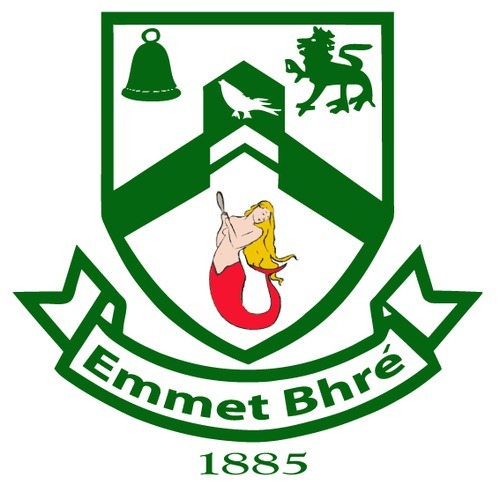 St Pats scored a goal with 7 minutes remaining which could have signalled a comeback but instead Bray Emmets went up the field and scored a couple of brilliant points to seal the win. It is very hard to single out individuals as this was a fantastic team effort by all and a great end to the season. This team have scored 29 goals in 5 games in the championship – a testament to the hard work they have put in with their coach Niall McGraynor on the training field.